Gunung Kidul Regency is in the south east of Yogyakarta. This regency is like the Bali of Yogyakarta. Even better than many parts of Bali, the beaches here are near pristine with clean and clear water! 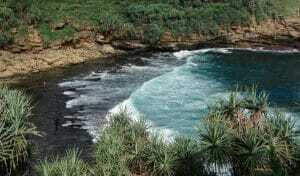 Besides beaches, Gunung Kidul is also blessed with many natural structures like caves and cliffs. Here we will cover some of the most notable things to do in Gunung Kidul and Gunung Kidul places of interest. 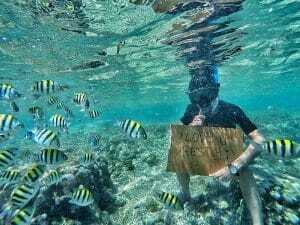 The southern part of Gunung Kidul has several exotic and beautiful beaches: Baron, Kukup, Krakal, Drini, Sepanjang, Sundak, Siung Beach, Wediombo and Sadeng. For adventure seekers, you may consider going to Kalisuci for cave tubing and Goa Jomblang for some hiking and exporing. For accommodation options, do consider planning your stay at Wonosari. Timang Beach is essentially a white-sand beach that's divided into two parts. The first part on the east is a white sandy beach whereas the second western part and is a steep hill formed by rocks. The main draw of this attraction is the unique Panjang Island located right across the beach that' sconnected via a simple 'cable car'. Panjang Island is also knownby the locals as the best place for lobster huntung. 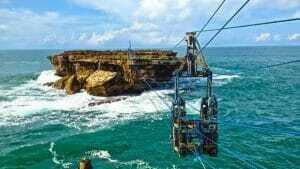 Coming to Timang beach is definitely one of the best things to do in Gunung Kidul and it's also one of the top Gunung Kidul places of interest. Jomblang Cave (Goa Jomblang) is one of the newest things to do in Gunung Kidul. It's a relatively short and simple exploration where you will first rappel 30m vertically down into the entrance of the cave. You will then take a short walk into the cave. The main draw of Jomblang Cave is the 'instagrammable' shot visitors could take once they reach the heart of the cave (Grubug Cave). You would take a picture of yourself standing under the 'light from heaven' as sunlight shines through the gaping hole that's vertically above you. One-of-a-kind experience and photo shot! Kalisuci cave tubing is one of the top things to do in Gunung Kidul and also in Yogyakarta. Cave tubing is basically the simple act of sitting down on a special large tyre that will float on the gentle water that runs through river, caves, and ravines. The waters here are really clean and turquoise in colour. You don't have to worry about safety as all the necessary equipment like helmet and life vest will be provided to you. Extremely popular with snorkelers and swimmers, Nglambor Beach is one of the top Gunung Kidul places of interest. It has crystal clear waters with unspoilt coral reefs and beautiful fishes. If you are planning to visit a number of Gunung Kidul places of interest, consider staying at the nearest town of Wonosari. Otherwise, travelling from Yogyakarta city to Nglambor Beach would take you more than 2 hours and close to 3 hours to Timang Beach. Moreover, there's no public transport to reach this region from Yogyakarta city centre. So you'd need to arrange for a taxi or private vehicle for your transportation.